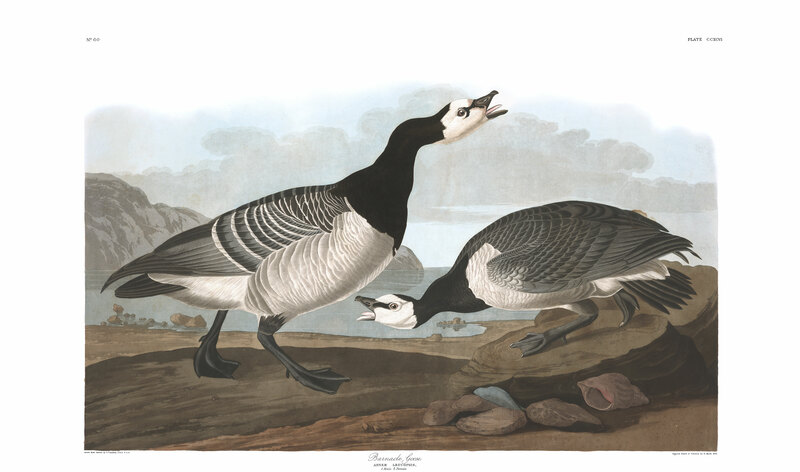 Several old gunners on the coast of Massachusetts and Maine, who were Englishmen by birth, assured me that they had killed Bernacles there, and that these birds brought a higher price in the markets than the Common Brant Geese. The Prince of Musignano states in his Synopsis that they are very rare and accidental in the United States, and Mr. NUTTALL says that they are "mere stragglers" there. For my part, I acknowledge that I never met with one of them, either along the coast or in the interior, although I have seen beautiful mounted specimens in various parts. Being neither anxious to add to our Fauna, nor willing unnecessarily to detract from it, I have figured a pair of these birds, with the hope that ere long, the assertion of the gunners, and those of the authors above mentioned, may be abundantly verified by the slaughter of many Geese. In the mean time I must further confess my ignorance of the habits of the Bernacle. Mr. SELBY thus speaks of it in the second volume of his Illustrations:--"The Bernicle is amongst the number of our winter visitants, annually resorting in vast numbers, upon the approach of autumn, to the western shores of Britain, and to the north of Ireland. Upon the Lancashire coast, the Solway Frith, &c. it is very abundant; frequenting the marshy grounds that are occasionally covered by the spring-tides, and such sands as produce the sea-grasses and plants upon which it feeds. Upon the eastern and southern shores of Britain it is of rare occurrence, its place being supplied by its nearly allied congener, the Brant Goose (Anser Brenta); which again is as rarely seen upon the opposite coast of the island. Like the rest of the genus, the Bernicle is a very wary bird, and can only be approached by the most cautions manoeuvers. It is sometimes shot by moonlight, when it comes on the sands to feed, by persons couched on the ground, or from behind any occasional shelter in such places as the flocks are known to frequent. Its flesh is sweet and tender, and highly esteemed for the table. Upon the approach of spring it leaves our shores for more northern countries, and by the middle of March the whole have retired." It is known to breed in Iceland, Spitzbergen, Greenland, &c. as well as in Lapland, the northern parts of Russia, and northern Asia. It also inhabits Hudson's Bay and other polar districts of the American continent. During its equatorial or winter migration, it is abundant in Holland, France, and parts of Germany. The eggs, which I describe from specimens deposited in the rich Museum of the University of Edinburgh, measure two inches and seven-eighths by one inch and seven-eighths, and are of a uniform yellowish-cream colour. I have represented an adult male in spring, and a female of the preceding year. ANSER LEUCOPSIS, Bonap. Syn., p. 377. BERNACLE GOOSE, Nutt. Man., vol. ii. p. 355. BERNACLE GOOSE, Anser leucopsis, Aud. Orn. Biog., vol. iii. p. 609. Male, 27, 56. Female, 23 1/2, 52. Bill much shorter than the head, higher than broad at the base, somewhat conical, slightly depressed towards the end, narrowed and rounded at the tip. Upper mandible with the dorsal line sloping, the ridge broad and flattened, the sides sloping, the edges soft and obtuse, the oblique marginal lamellae short, transverse, about thirty on each side, besides minute anterior ones; the unguis roundish, convex, striato-denticulate on the inner edge. Nasal groove elliptical, commencing at the base and extending to the middle of the bill, parallel to the ridge, filled by the soft membrane of the bill; nostrils lateral, submedial, longitudinal, narrow-elliptical, open, pervious. Lower mandible straight, with the angle very long, rather wide, and rounded, the sides sloping rapidly upwards, the edges soft and obtuse, with about thirty-eight distinct lamellae on an inflected plane. Head small, oblong, compressed. Neck rather long and slender. Body full, slightly depressed. Feet short, stout, placed a little behind the centre of the body; legs bare a little above the tibio-tarsal joint. Tarsus short, a little compressed, covered all round with angular reticulated scales, which are smaller behind. Hind toe extremely small, with a very narrow membrane; third toe longest, fourth a little shorter, but longer than second; all the toes reticulated above at the base, but with narrow transverse scutella towards the end; the three anterior connected by a reticulated membrane, the outer; with a thick margin, the inner with the margin extended into a two-lobed web. Claws small, arched, rather compressed, except that of the middle toe, which is bent obliquely outwards, depressed, with a curved edge. Wings of moderate length, with an obtuse protuberance at the flexure. Plumage close, rather short, compact above, blended on the head, neck, and lower parts of the body. The feathers of the head and neck very narrow, of the back very broad and abrupt, of the breast and belly broadly rounded. Wings when closed extending about an inch and a quarter beyond the tail, acute; primaries very strong, curved, the second longest; secondaries long, broad, rounded. Tail very short, rounded, of sixteen stiff rounded and acuminate feathers. Bill, feet, and claws black. Iris dark hazel. Anterior part of the head, including a broad space above the eye, the sides of the head, and the throat, white; the feathers margining the bill, and a line from the bill to the eye, curving below the lower eyelid, and running along the upper, brownish-black. Neck all round glossy black, of which colour are the anterior or dorsal feathers, the scapulars, and the wing-coverts, towards their extremities, while their bases are ash-grey, and their terminal margins white. The shorter feathers on the middle of the back are similar; those on the rump and the tail-feathers deep black. The quills are greyish-black, darker towards the tips, the outer webs more or less tinged with ash-grey. The breast, sides, and abdomen greyish-white, the upper feathers of the sides with more grey; the upper and lower tail-coverts, and the sides of the rump, pure white. Length 27 inches, extent of wings 4 feet 8 inches; bill along the ridge 1 1/2, in depth at the base 10/12, in breadth 9/12; tarsus 2 10/12, middle toe and claw 2 10/12; wing from flexure 17; tail 6; the feet extend beyond the tail 3 1/2 inches. Weight 4 lbs. 1 oz. The female, which is much smaller, has the same colours, the black parts being tined with brown, and the tints generally duller. Length 23 1/2 inches, extent of wings 4 feet 4 inches; the feet extend beyond the tail 2 1/2 inches. Weight 2 lbs. 9 oz.